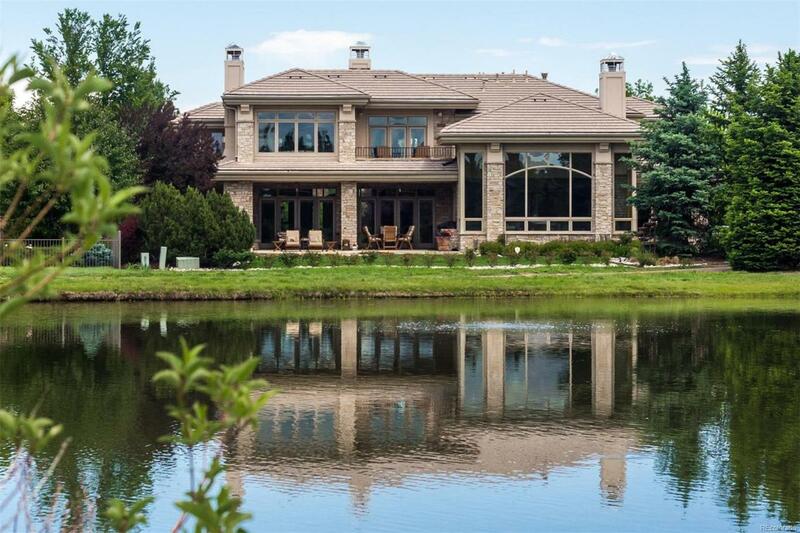 Colorado Contemporary Splendor in private gated community. This architectural gem sits on Buell lake with walls of windows framing rare water and mountain views that beckon you to enjoy outdoor living year-round on the covered terrace with fireplace. Dramatic open spaces enhance the light that floods this home. Custom craftsmanship throughout. The airy floor plan provides easy entertaining flow through formal living and dining spaces accented by spectacular fireplace to the great room with casual dining open to the gourmet kitchen with professional appliances, huge pantry and wet bar. Main floor bedroom suite and private office. Upstairs, the sumptuous master suite and huge closet are adjacent to a lovely study with lakeside balcony. Upstairs laundry, 4 more bedroom suites (1 can be nanny suite with separate staircase). Lower level has private theatre, open recreation and entertainment bar, powder room, bedroom and bath. Enjoy Buell Mansion, private pool, tennis courts & playground. Association Name Primary Buell Mansion Owners Association Inc.